2 Bedroom 2 Bathroom sleeps 5. Large Flat screen TV and Internet. High season rates £ 595 sterling. Pool, cable TV, DVD, dishwasher, washing machine. Sea views and 3 sun terraces.. 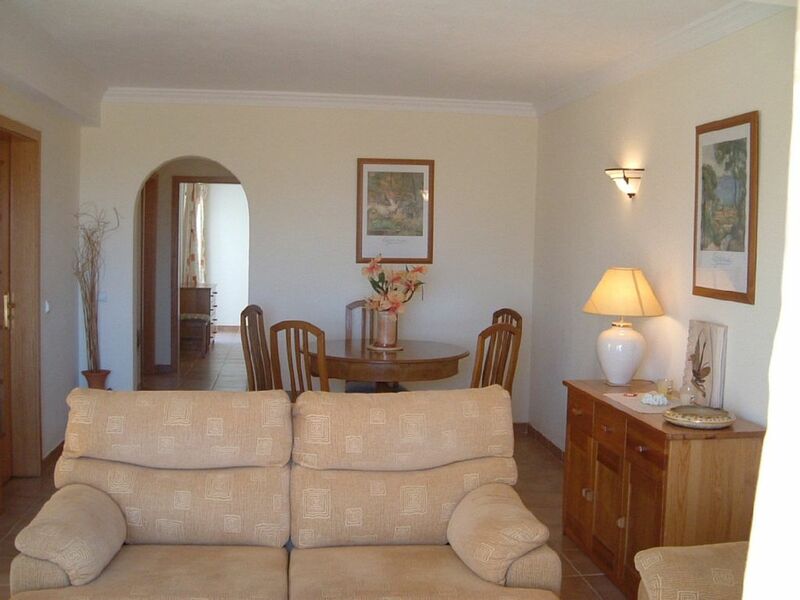 This property is a very well furnished, comfortable apartment located at Villas do Mar, which consists of ten apartments with communal pool situated in quiet residential location on the headland near the village church and entrance to the new broad walk, within 300m of the beach and center of Carvoeiro. The property consists of a high quality 2 bed 2 bath apartment and separate studio for rental either together or as separate units. The apartment is equipped as the owner’s holiday home, with all amenities including modern kitchen, lounge dining room, main bathroom and one en-suite shower room. The studio on the second floor has large sun terrace is entered via patio doors with security grill gate, into a spacious well equipped area with high quality bamboo furniture, king sized bed, kitchenette, and separate 'full height ' shower room. Both units have TV/Internet with TV stations in many languages and DVD player with a selection of films. The studio was upgraded in 2012 with new kitchen and shower room. Further additions are planned for the studio and apartment. Airport transfers can be arranged, call now for further information. The studio is completely separate with its own stairway access, sun terrace, bathroom/kitchen facilities. Electric heating is available during low season. Please park in the space number 8 adjacent to the apartment. The lounge is very comfortably furnished with 2 settees, large dining table with 6 chairs, tv, dvd, wifi. 3 terraces, one to the lounge and one to each bedroom. The Apartment is entered via steps, making it unsuitable for wheelchair access. It is fine for active elderly people. The Studio is completely separate with its own access and bathroom/kitchen facilities. Hair dryer available in each unit. Don't be disappointed if the units are unavailable for the dates you require! Check with the owner, we can also book other units at Villas do Mar! The two of us were lucky enough to stay here at the beginning of September 2010 and thoroughly enjoyed it. However we went out most days and found a lovely range of beaches from Caneiros which has an excellent restaurant, Playa Grande, Praia da Rocha We also drove to Monchique town and on other days found lovely walks along the cliffs. The apartment is probably not good for unfit people being an uphill walk from town and situated on the first floor, but otherwise enjoy!! The 2 of us stayed in the Apartment the first week of September 2009. The complex is charming, only a few properties so lovely and quiet. Nice clean pool although terribly cold as it's in the shade for part of the day although we were very appreciative of it in 35 degree heat. The area was lovely and I would definately like to return some day. Location is great for walking although it's quite hilly so probably not for the disabled or anyone who has difficulty walking. Apartment was roomy and well equipped and the owner was very helpful and friendly so would definately recommend a stay here. On the whole, found Portugal to be expensive but then so is everywhere in Europe at the moment due to the poor exchange rates. In summary, loved it to bits and would definately return. We always spend a long time choosing where we are going to stay and we definitely got it right this time, not only as far as the location was concerned but also the flat itself. It was very well-equipped, e.g. lots of towels and bedding. The flat also had 3 terraces, each with its own clothes horse which meant everyone could dry their towels and costumes when they got back from the beach or pool. Even though the pool itself isn't enormous nor the area around it, it was perfect for a quick dip or just to chill next to it. The location of the flat was just what we were looking for; somewhere within walking distance of the town centre but away from the noise. The walk into the village is very picturesque. Even though the owners Tony and Tina weren't on site it was as if they were because there was even email contact while we were there to check we were ok . The restaurant recommendations were very useful. I wouldn't hesitate in recommending the flat. Un apartamento muy confortable y situado en un sitio muy tranquilo. Se puede ir andando a cualquier parte de Carvoeiro y el dueño del apartamento proporciona mucha información de los restaurantes-bares de la zona. Además en un cajon de uno de los muebles del salon hay muchos planos e informacion de la zona y de todo el Algarve. La comunicacion con el propietario fue perfecta, a través de e-mail. Lo recomendare a mis amigos que quieran ir por esta zona. Villas do Mar is in the best location in Carvoeiro. Very close to the village yet in a quiet position near village school and church. Short 5 min walk down to the square or 80m to lovely walks towards Algar Seco and along the headland paths. Special rates available for long lets in low season. If we are booked we have other apartments and studios at Villas do Mar for rental and several other villas in Carvoeiro. The Map pointer is not accurate! 25% deposit on confirmation of booking remainder to be paid 8 weeks prior to departure. *Special winter rates for long stays* Contact the owner for 2 person rates in the apartment. Cleaning charge only applicable for bookings of less than 5 nights Electricity charged at cost during low season.